One of the best places to live. So once you find your new home in Minnetonka you need to find the best home inspector. Do not trust a large purchase to just anyone? Do you want your inspector to use the latest technology and tools available? Do you want your inspector to use the very latest techniques in recognition? Do you want your inspector to work for you and you only? IF you answered yes to all of these questions, then why would you hire your Realtors Inspector or hire a guy who DOES NOT use both Thermal Infrared Imaging and Moisture Meters. Lets face it, many inspectors are in the pockets of Realtors. They use these long drawn out Narrative reports filled with fluff to impress you, but also to hide some of the severity of what they find. They "sugercoat" it, and say they are offering alternatives. This is exactly what many realtors want. Neutrality at best! Where does this leave you, confused! You need information, precise information on exactly what is wrong and if it is to tell you so. Most Minnetonka homes are not cheap. So do not hire the cheapest. Also the most expensive does not mean the best! 7 County Home Inspection is a highly competitive home inspection company that offers the very latest home technology available to a home inspector. 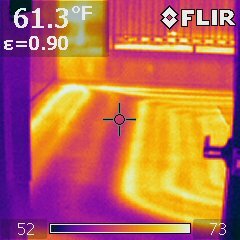 The Thermal Infrared Camera and Moisture meter we use is there to help us uncover those items that are not obvious to the naked eye. This technology is used by military, large industries and aviation to help see the "not so obvious" hidden defects that pose a hazard. Our reports are detailed in a way to help you clearly understand what is wrong with digital photos. We are an independently owned and operated Minneapolis home inspection company. As President of the InterNachi Minnesota Chapter, I strive to stay on top of the latest home inspecton recognition and information. Minnetonka Minnesota holds some of the most valuable and unique homes available, not only in the state, but in the country. These properties deserve the absolute best inspection! Call us for a professional inspection @ 612-919-3844. We look forward to serving you with the highest integrity!